It’s Friday night… the candles are glimmering, the water is steaming and my bath is making headway in doing the much-needed job – saving me from my week’s exhaustion and self-questioning. Another seven days of full-on work pressures, personal challenges and the usual navigation of life’s ups and downs in today’s pressured and demanding world. It’s going to take a bit more than a bath to re-centre me after this week. Am I really as useless as I think I am? Is my life genuinely this wrong? Twelve hours later I find myself sitting quietly at the back of a spacious, light and calming room overlooking the Thames. Seats vary from upright to benched to squishy cushions, and at the front is a small stage with a high chair and a mic. 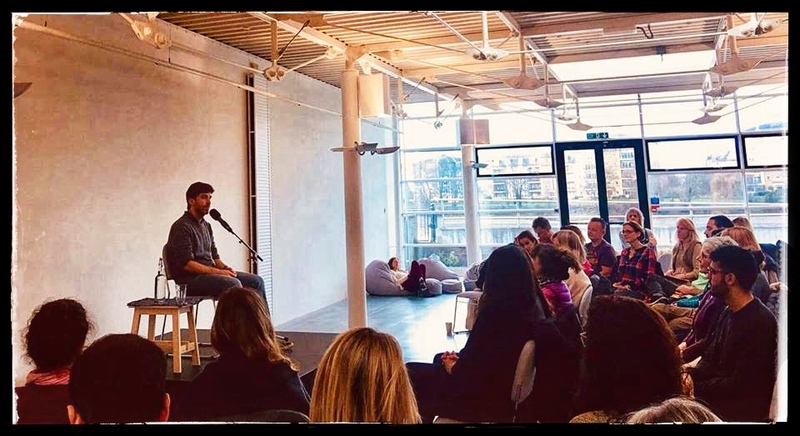 Jeff Foster, spiritual teacher and author of The Deepest Acceptance: Radical Awakening in Ordinary Life and The Way of Rest: Finding the Courage to Hold Everything in Love (amongst others) will be seated there soon. I’ve no expectations for this day. I’m not fully familiar with Jeff’s work – I read a piece of his poetry and liked it, and so thought, why not? A few weeks later here I am, sitting on my creatively designed but slightly uncomfortable bench, and I have a moment of (as I always do at these events if I am honest) why on earth am I here? But the energy in the room is gentle, the people warmly smiley, and I feel the calm kick in. Jeff enters and sits. Without a word he closes his eyes… and the silence feels interminable. I wonder, am I meant to close my eyes? Am I supposed to meditate? The discomfort knocks again at my door. And as Jeff starts speaking, his words are slow (very), pensive, bulleted with silent breaks… all so different from the effervescent speakers I am used to. Yet, as is often the way, this day turned out to be very special. Jeff, in the words of one lady I met, seemed ‘very glum’ at first. He was self-deprecating. He even swore (surely not). Yet at the same time, he laughed at himself, and found joy in the tragedy. This truly was the first event of this kind I have been to (and let me tell you I have attended many) where I left feeling like who I am was just right, and where my life was at, was simply where it was meant to be. So how did Jeff do it? The day was Jeff talking and sharing stories and ideas, followed by questions and rather long (he called them rambly!) answers. There were no exercises, no talking to your neighbour and sharing, no dos and don’ts. Jeff made it clear he had no ‘teachings’ and was not there to deliver any dogmas or ideologies. He intensely disliked the world ‘spiritual’, questioning how on earth we can accurately define it. He used the word ‘fancy’ a lot (fancy gurus, fancy teachings – none of which he was keen on) as well as ‘violent’ (violent thoughts, violent ideas). Some may go so far as to say he was negative and miserable (he said people did leave his sessions sometimes depressed!). In fact he himself suggested we could well be bored. But I was far from that. His every word cut through… easily, without effort. For me, his approach was wholly refreshing. He was real, he was honest, he was authentic; in many ways, he was just like you and me. For the first time I didn’t feel that the person on the stage was superior to me and I needed to change. There were no comparisons, no I need to go home and do this to better myself, no if only I could be like Jeff. Just real stories and real emotions. Jeff said his thoughts were simple. And actually on one hand that was true: simple and accessible (albeit on the other, the complex mind of the man in front of me was apparent). He believed in living in the present moment. He believed we are all perfectly imperfect. He said that our thoughts are not who we are, and shared stories of many of the dark thoughts that had inhabited his mind – that didn’t make him (or in turn my bad thoughts, me) a bad person. That is just the nature of the human mind; we all have negative thoughts, and that is very different from acting on them. He also felt very strongly that we should all (including children) be taught to sit with our feelings, whatever they may be. It’s OK to feel sad, angry, broken. And if we are able to sit with these emotions, not label them in any way, just feel physically where they take hold, they will most likely pass, or at the least we will not create a whole narrative around them, which only causes more despair. He was all about NOT changing, deleting, fixing, transforming… but accepting, not in the mind, but in the being, the present. And whatever the present is, that is OK.
Jeff talked frankly and with refreshingly raw honesty about caring for his father who had Alzheimer’s; the thoughts he had, the way it made him feel. But he said his father was his true teacher throughout this time. And as Jeff sat at his bedside just before he died and sang to him, ‘My Way’ (his Dad’s favourite song), it was a perfectly imperfect moment. Just as it was. I am not sure if Jeff would be everybody’s cup of tea, but he was certainly up there for me with my Jasmine Rose I so love imbibing daily. As I walked along the riverside home, I felt completely at peace… but not in any type of ‘altered state’ way, there was no ‘great shift’, no ‘enlightening moment’. There was instead this truly freeing feeling that my life and I were just where we were meant to be – in all their messy, upside down ways. And that was very much and happily OK. Thank you Jeff Foster. Very much. What a great experience! Thank you for writing this. I love Jeff and his books and his messages. I hoped to be at this event. Now I feel like I sort of was!